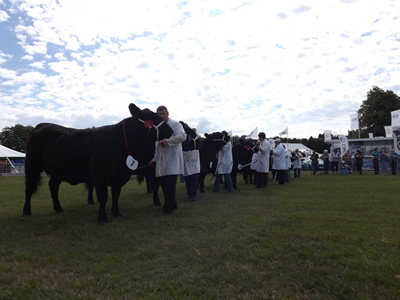 GALLOWAY NATIONAL SHOW – BORDER UNION SHOW – KELSO – SATURDAY 27TH JULY 2013. Judge Mr K Van Hollen, Am Buchholz 8 24321 Gieka, Germany. A round trip of 220 miles, certainly paid off for the Maxwell Family, Blairvockie Farm, Rowandennan, Drymen, Glasgow for they received top honours at the Galloway National Show held at Border Union Show, Kelso. 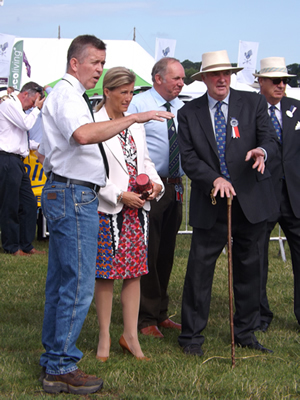 The busy ringside, which had come to help celebrate the Society’s Bi centenary saw German judge Mr Karl Van Hollen give the championship rosette to Klondyke Raider, this 2008 born bull is by the German import Holsten Ed N54. He was bred by Klondyke Farms Ltd, Moniaive, Thornhill and was purchased in a private deal in 2010. Raider has had a very successful year to date, as he was male and reserve overall champion at this year’s Royal Highland Show. Mr Van Hollen explained in perfect English that his champion “ was very complete, well muscled, long and a good walker” he went on to comment “ the standard of animals were of highest quality, especially the heifers”. The reserve overall champion, female and junior champion was from Messrs J Finlay, Blackcraig, Corsock, Castle Douglas, very ably showen by son Iain, this very stylish 2011 born heifer Blackcraig Noreen T433, is a Finmac Norseman daughter and out of famous show cow Blackcraig Noreen L122, previous winner of the 2006 and 2011 Royal Highland Shows. 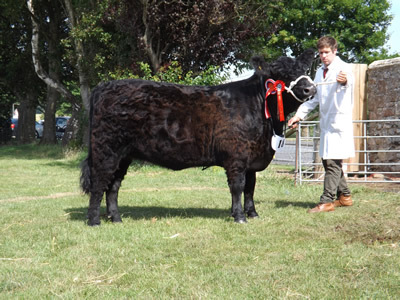 She has also had a successful year, as she was reserve female and junior champion at 2013 Royal Highland Show. 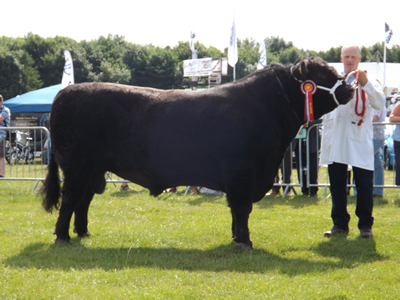 The reserve male champion was exhibited by J & S Ross, Romesbeoch, Shawhead, Dumfries , Turbo Tam of Nether Cleugh, this October 2011 born was bred by Peter Hunter Blair, Nether Cleugh, Dalry and was purchased by the Ross family at 2013 Spring Sale. His sire is Blackcraig Quest and out of Nerys Patricia of Nether Cleugh. He was male champion at the Great Yorkshire show. Another from the Ross Family’s strong line up was reserve female Moira 408 of Romesbeoch is a Kingpin of Nether Cleugh daughter and out of Doon of Urr Moira 79th, this 2005 born cow was shown with heifer calf at foot. BULL BORN BEFORE 1ST SEPTEMBER 2011. 1st J, M & D Maxwell, Blairvockie, Rowandenna, Drymen – Klondyke Raider, sire Holsten Ed. BULL BORN ON OR AFTER 1ST SEPTEMBER 2011. COW IN CALF OR IN MILK BORN ON OR AFTER 1ST SEPTEMBER 2009 AND BEFORE 1ST SEPTEMBER 2010. 1st J & S Ross – Moira 1003 of Romesbeoch. 3rd Klondyke Farms Ltd,– Klondyke Future, sire Klondyke Magnum. 5th D & R Conrthwaite, Balgray, Lockerbie – Neave U of Over Barskeoch, Sire Barlaes Fearless. 3rd Peter Hunter Blair, Nether Cleugh, Dalry, Castle Douglas – Foxglove Tulip of Nether Cleugh, sire Blackcraig Quest. 1st J & S Ross – Moira 1465 of Romesbeoch.